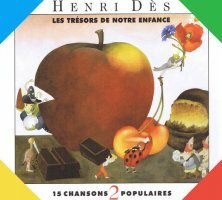 A popular selection of children's songs from the well-renowned French musician, Henri Dès. The CD includes a booklet featuring the lyrics to all of the songs, together with one-line musical scores. Karaoke tracks for each song are also provided. This CD and book is intended for native French speakers and so there is no English translation provided. This is also excellent for use with young learners so that they can get used to the sounds of the French language. It is NOT intended to teach specific vocabulary words / topics etc to young beginners.